Born in Russia in 1892, Lozowick came to this country at the age of 14 to join his brother in New York City. By 1919 he had attended art school, finished college, served in the army, and traveled throughout the United States visiting major cities which would later become subjects of his work. From 1919 to 1924 Lozowick lived and traveled throughout Europe, staying in Paris, Berlin, and Moscow. 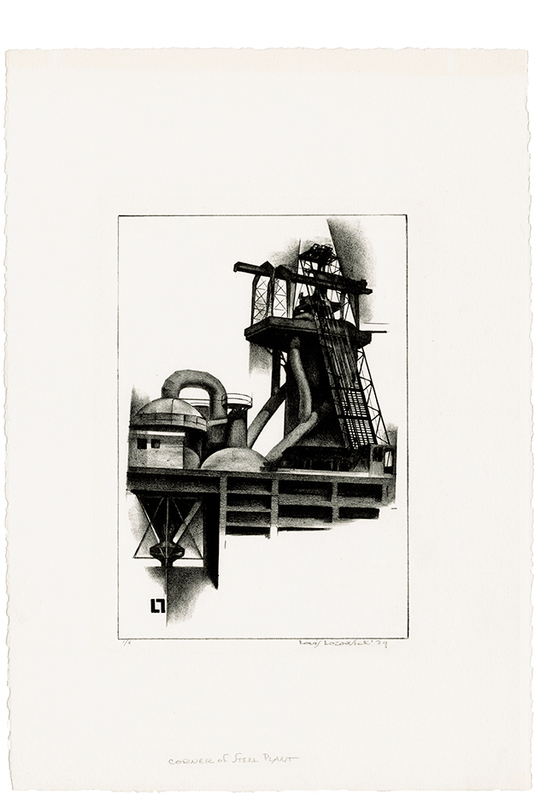 In 1920 he began his Machine Age drawings, the ‘Machine Ornament’ series and three years later he made his first print. Having assimilated European Constructivist and Cubist theories, and the Bauhaus manifesto promoting the integration of applied and fine art, Lozowick was inspired to present the rapidly growing New York City skyline with its monumental skyscrapers as modern symbols of optimism. Like many other Depression era artists, he identified closely with the common worker and valued the consummate craft and workmanship dictated by the printmaking process. 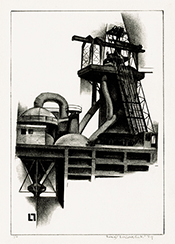 His versatility and range of interests were exemplified by his stage sets for the 1926 production of Georg Kaiser’s play “Gas,” the first Constructivist production seen in America. A year later, his images and essay were centerpieces in the pivotal 1927 Machine Age Exposition in New York. Assigned to the WPA New York Graphic Arts Division in 1935, he left in 1936 to accept a commission from the prestigious Treasury Relief Art Project for two large oil paintings for the Post Office at 33rd Street in Manhattan. 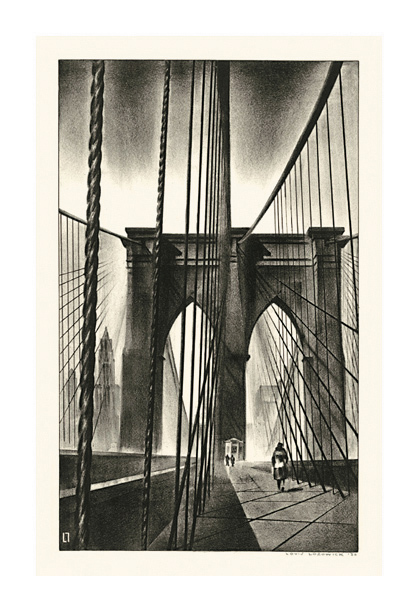 His preliminary lithographic studies for the paintings are among his most compelling images of New York skyscraper and bridge forms. 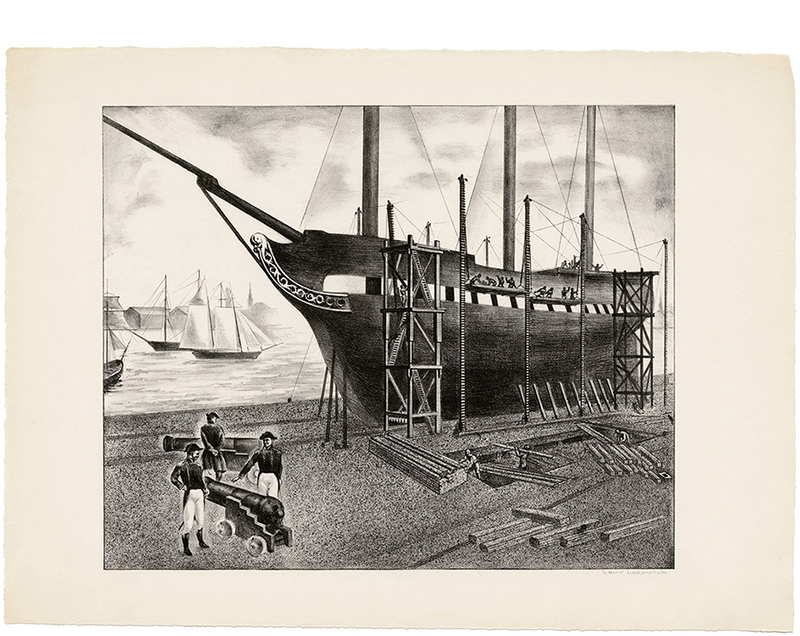 Returning to the Project in 1938, Lozowick experimented with various printmaking mediums, including wood engraving, drypoint, and screen printing, until the end of his appointment in 1940. 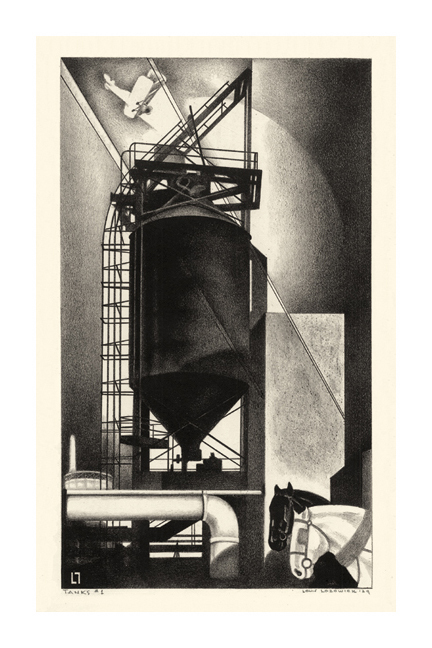 During the next three decades, encouraged by Carl Zigrosser of the Weyhe Gallery, he devoted himself primarily to lithography, mounting several solo exhibitions at major New York galleries, and a retrospective at the Whitney Museum of American Art in 1972. Backyards of Broadway (Waterfront I)= 1929, Lithograph. Flint 7. Edition 10. Signed in pencil. Image size 14 3/8 x 9 1/4 inches (265 x 235 mm), sheet size 15 3/4 x 11 1/2 inches (400 x 292 mm). A superb impression, on BFK Rives off-white wove paper, with full margins (11/16 to 1 1/8 inches, deckle all around), in excellent condition. Printing is attributed to Ben Shahn. Scarce. A view from Broadway looking toward the Hudson River piers, NYC. Collections: Cleveland Museum of Art, Harvard Art Musuems, Museum of Modern Art, Smithsonian American Art Museum. 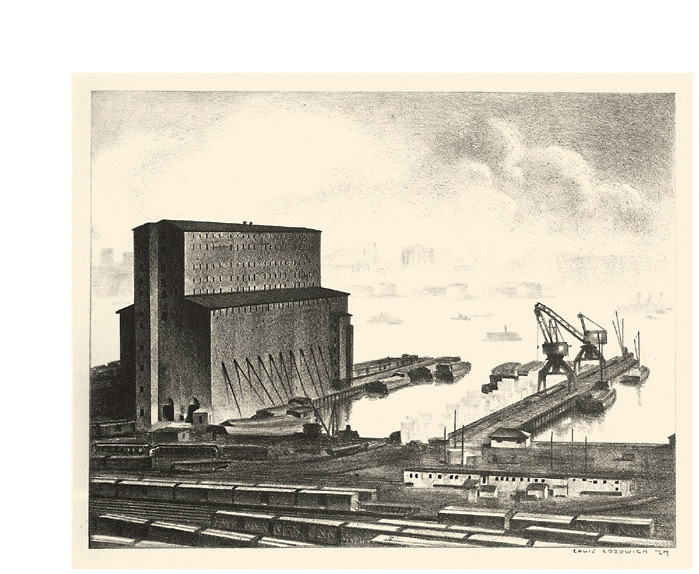 Hoboken (Waterfront II; Grain Elevator; Hoboken)= 1927-1928, Lithograph. Flint 9. Edition c. 20. Signed and dated ‘27 in pencil. Image size 9 7/8 x 13 7/16 inches (252 x 341 mm); sheet size 14 15/16 x 17 1/2 inches (385 x 445 mm). A fine impression, on cream wove chine collé, with full margins (2 to 3 inches), in excellent condition. Printed by Desjobert, Paris. Scarce. 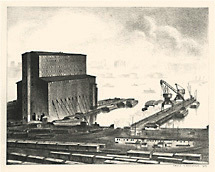 Corner of Steel Plant = 1929, Lithograph. Flint 21. Signed, dated and numbered 5/25 in pencil. Signed with the artist’s monogram in the stone, lower left. Image size 11 5/16 x 7 3/4 inches (287 x 197 mm); sheet size 15 7/8 x 11 1/4 inches (403 x 286 mm). A superb impression, on cream wove paper, with full margins (1 1/2 to 2 1/2 inches), in excellent condition. A scarce impression from the first edition printed in 1929 by master lithographer George C. Miller. Collections: Crystal Bridges Museum of American, Memphis Brooks Museum of Art, Philadelphia Museum of Art, Smithsonian American Art Museum. 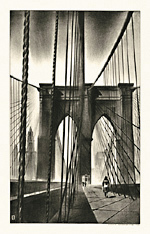 Brooklyn Bridge = 1929, Lithograph. Flint 48. Edition 100. Signed and dated '30 in pencil. Signed with the artist's monogram in the stone, lower left. Image size 13 1/8 x 7 7/8 inches (333 x 200 mm), sheet size 16 x 11 1/2 inches (406 x 292 mm). A superb impression, with a dramatic range of values, on cream wove paper; full margins (1 1/2 to 3 1/4 inches), in excellent condition. Illustrated and exhibited in Precisionism in America, 1915-1941: Reordering Reality, Harry N. Abrams and The Montclair Art Museum, 1994. 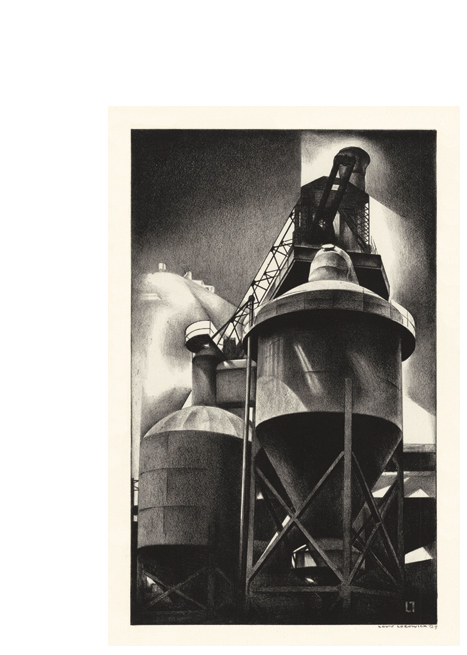 Mary S. Collins Prize for best lithograph, Third Exhibition of American Lithography, Phildalephia Print Club, 1931. Collections: Cornell University Library, Brooklyn Museum, Museum of Fine Arts (Boston), Museum of Modern Art, New York Public Library, Philadelphia Museum of Art, Smithsonian American Art Museum, Whitney Museum of American Art, Wolfsonian FIU. 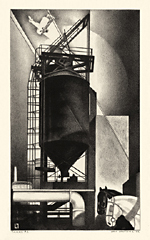 Tanks #1 = 1929, Lithograph. Flint 39. Edition 50. Signed, titled and dated in pencil. Signed with the artist's monogram in the stone, lower left. Image size 13 15/16 x 8 1/16 inches (355 x 204 mm), sheet size 15 13/16 x 11 1/2 inches (401 x 292 mm). A fine, rich impression, on cream wove paper, with full margins (11/16 to 1 3/4 inches), in excellent condition. Reproduced: Prints and Their Creators, A World History, Carl Zigrosser, Crown Publishers Inc., 1974. Collections: British Museum, Brooklyn Museum, New York Public Library, Philadelphia Museum of Art, Smithsonian American Art Museum. 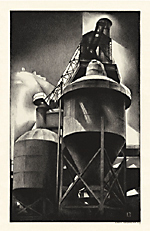 Tanks #2 (Steel Plant) = 1929, Lithograph. Flint 40. Edition 50. Signed and dated in pencil. Signed with the artist's monogram in the stone, lower right. Image size 14 5/8 x 9 inches (372 x 229 mm); sheet size 18 1/2 x 12 5/8 inches (470 x 320 mm). A fine, rich impression, on cream wove paper, with full margins (1 7/8 to 2 1/4 inches). Pale tape staining in the top right and left sheet corners, well away from the image, otherwise in excellent condition. An impression from the original edition of 50 printed by George C. Miller in 1929. Collections: Crystal Bridges Museum of American Art, New York Public Library, Smithsonian American Art Museum, Whitney Museum of American Art. City on a Rock – Cohoes = 1931, Lithograph. Flint 79. Edition 242 plus 15. Signed and dated '31 in pencil. Signed with the artist's monogram in the stone, lower right. Image size 8 1/8 x 12 7/8 inches (206 x 327 mm); sheet size 11 3/8 x 15 7/8 (289 x 403 mm). A fine impression on cream wove paper, with full margins (1 3/8 to 1 5/8 inches); in excellent condition. Reproduced and exhibited in The American Scene: Prints from Hopper to Pollock, The British Museum, 2008. First prize, International Competitive Print Exhibition, The Print Club of Cleveland, Ohio, 1931. Published as the club’s membership print for that year. Collections: Cornell University Library, The British Museum, Library of Congress, Metropolitan Museum of Art, New York Public Library, Smithsonian American Art Museum. 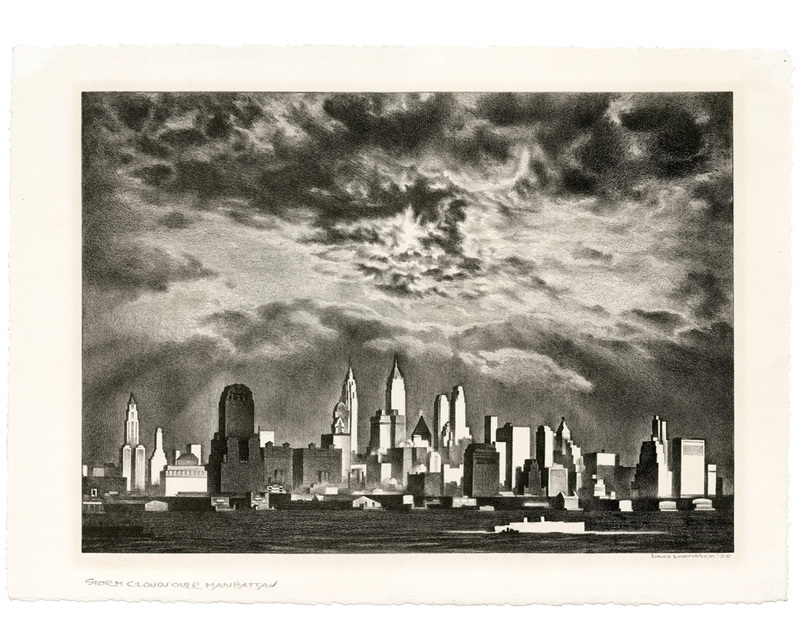 Storm Clouds Over Manhattan = 1935, Lithograph. Flint 126. Edition 25. Signed and dated ‘35 in pencil. 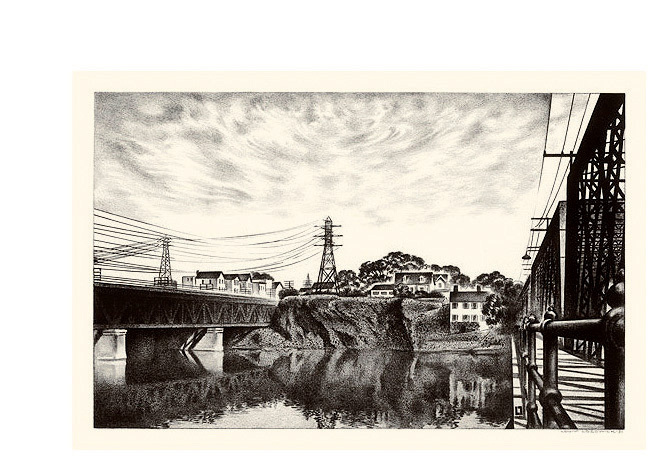 Titled in pencil in the artist's hand in the bottom left margin. Scarce. Image size: 11 7/8 x 16 7/8 inches (241 x 429 mm); sheet size 14 3/8 x 20 1/4 inches (365 x 514 mm). A superb impression, on off-white wove paper; the full sheet with deckle all around (margins, 1 1/4 to 1 3/4 inches). Very pale toning around the image (within the original mat opening), otherwise in excellent condition. Printed by master lithographer George C. Miller. Scarce. This impression from the first edition; a second edition of 10, numbered 1/X - X/X was printed in 1972 (plate cancelled). 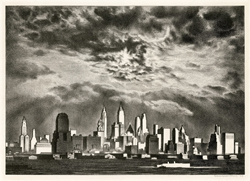 A smaller lithograph of similar composition followed this work; titled Storm Over Manhattan, it was published in by Associated American Artists, New York, in an edition of 189 (Flint 127). 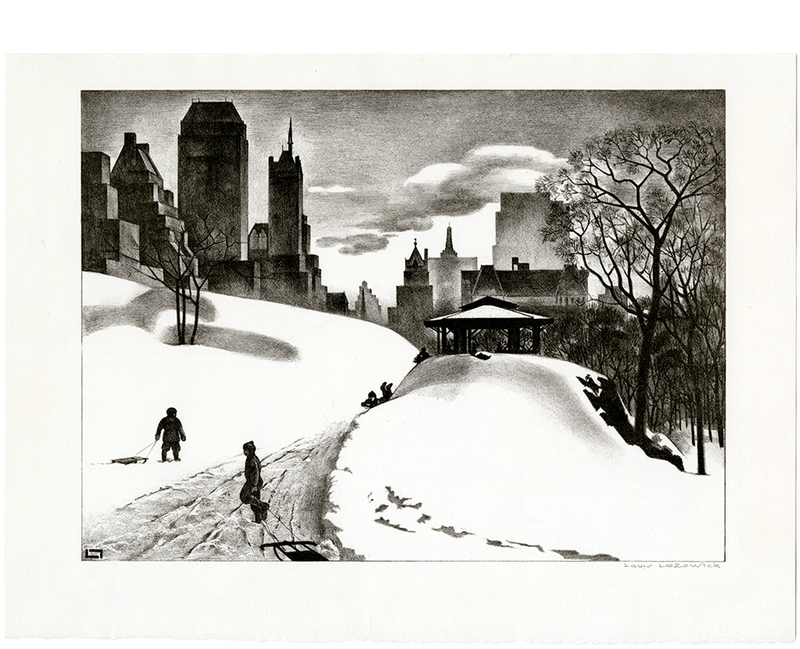 Reproduced and exhibited: City Life: New York in the 1930s: prints from the permanent collection of the Whitney Museum of American Art, Whitney Museum of American Art, 1987. Collections: Achenbach Foundation, Five Colleges Museum Consortium (Massachusetts), Iowa State University Museum, Metropolitan Museum of Art, Museum of Modern Art, Smithsonian American Art Museum, Whitney Musuem of American Art. 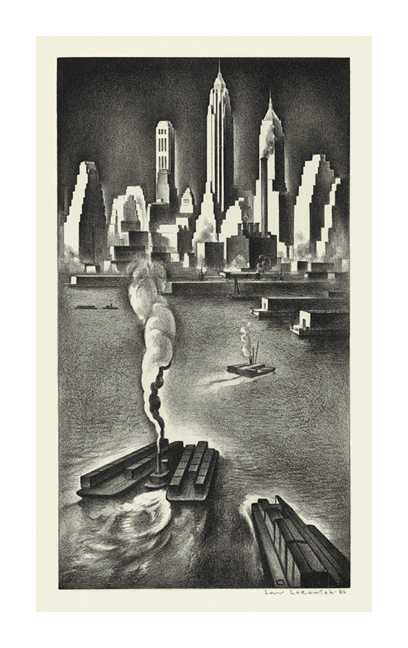 Mural Study: Lower Manhattan = 1936, Lithograph. Flint 135. Edition 10 or fewer. Signed and dated in pencil. Signed with the artist's monogram in the stone, lower right. Image size 13 5/16 x 7 3/16 inches (338 x 182 mm); sheet size 18 x 11 1/2 inches (457 X 292 mm). A fine, rich impression, on cream wove paper, with full margins (1 7/8 to 2 1/2 inches). Soft creasing in the top right sheet corner, well away from the image, otherwise in excellent condition. Printed by Theodore Cuno. Lozowick's study for a mural commissioned by the Treasury Relief Art Project for the Post Office at 33rd Street and 8th Avenue in New York City. Collections: Iowa State University Museum, Smithsonian American Art Museum, U.S. Treasury Collection, Wolfsonian FIU. 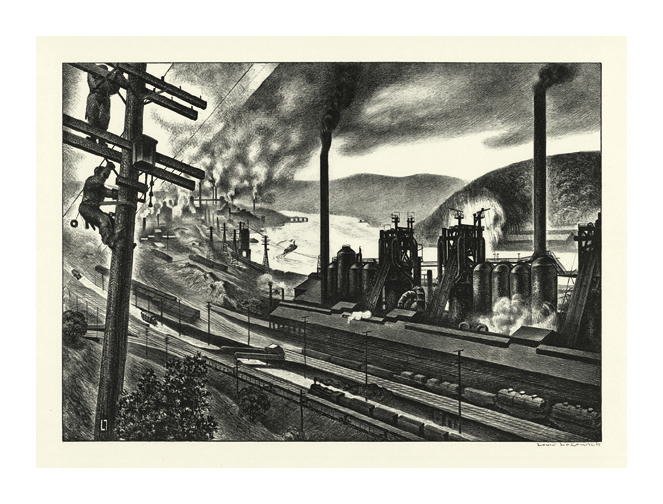 Steel Valley = 1936, Lithograph. Flint 141. Edition 15; AAA edition 250, 1942. Signed in pencil, with the artist's monogram in the stone, lower left. Image size 9 7/16 x 13 7/16 inches (240 x 341 mm); sheet size 11 7/8 x 15 7/8 inches (302 x 403 mm). A fine impression, on off-white wove paper, with full margins (1 1/8 to 1 1/2 inches), in excellent condition. An impression from the AAA edition printed by George Miller. Collections: Achenbach Foundation for Graphic Arts, San Francisco; Crystal Bridges Museum of American Art. Flint 138. Edition not stated. Signed in pencil. Image size 11 3/16 x 13 13/16 inches (284 x 351 mm); sheet size 14 x 19 1/8 inches (385 x 486 mm). A fine impression, on cream wove paper, with full margins (1 5/16 to 2 7/8 inches), in excellent condition. Collections: Smithsonian American Art Museum. 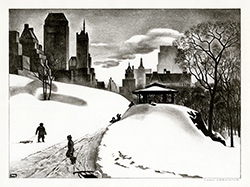 Winter Fun = 1940, Lithograph. Flint 188. Edition 20, 250 (1941). Signed in pencil, with the artist’s monogram in the stone, lower left. Image size 9 1/2 x 12 7/8 inches (241 x 327 mm); sheet size 12 1/2 x 16 inches (318 x 406 mm). Collections: Achenbach Foundation, de Young Fine Arts Museums of San Francisco; Metropolitan Museum of Art.